At a denominational conference twenty-five years ago, I presented a paper applying sociological theory to the question of conflict within the church. (I was surprised to find that they’ve still got it online.) I wrote the paper because I thought sociologists could help pastors understand the normalcy of conflict. But it got little play. All these years later, we still see conflict expressed as matters of personal disagreement and engage in social media debates about when Matthew 18 is applied. In reading Andy Crouch’s excellent Playing God last week, it struck me that my efforts to help the church deal with conflict were doomed before they started. Why? Because conflict is the outgrowth of a deeper concern: we don’t know what to do with POWER. Our inadequacy in conceptualizing power lies underneath competition for scarce resources or control of carpet selection. It keeps us from addressing the inherent challenges in Christian celebrities and makes it nearly impossible to have meaningful conversations about church abuse. As Andy observes in the first part of his wonderful book, we get in this fix because we’ve only considered one type of power. This form of power, written of by philosophers and social theorists, is a zero-sum vision of power. Because power is exercised to maintain one’s control over a situation (by not allowing someone else a foothold) we cannot show weakness or vulnerability. Opponents have to be squelched and obstacles overcome. With all deference to Jean Luc Picard, Andy call this “make it so” power. It reflects the exertion of force to accomplish a desired end in spite of any opposition that might exist. Then he states his key premise: God is involved in a very different form of power. Rather than being concerned with managing outcomes, the power is unleashed in ways that open up yet further vistas. Working carefully with the Creation narrative, he observes how often the creativity of God results in teeming — varieties of outcomes flowing from creation in all sorts of wonderful ways. The creative power of God is expressed by setting things free to be. He calls this “let there be” power. But there is yet another step. This is the power that lets lose human flourishing, what he calls “let us make” power. Two things are important in that little phrase. First, the subject is plural. Creative power in collaborative. Second, the verb involves creating something new that exhibits its own creative capacity. He illustrates this latter form through a long analysis of how he works with his cello teacher (I posted this extended quote on Facebook). Creative power of the “let us make” variety is not zero-sum but is generative: new forms of power arise without demolishing existing forms. All of our critiques of power (absolute power corrupts absolutely) are based on the “make it so” form of power. One of the sad realities of our culture war history of the last 35 years is that the church has been striving for power to change the world on the world’s terms. We seem to believe that if only we can get “those people” to vote right or agree with us or start buying that product that we will gain the upper hand for our position. A quick aside: the insufficiency of the “exert power” strategy is shown in James Davison Hunter’s To Change the World (see this post from November). In that book, Hunter critiques Andy Crouch for focusing on creativity (his first book) without paying attention to the institutional structures that provide levers to power. Instead, Hunter wants us to pursue Faithful Presence (but doesn’t really work out how that happens). In Playing God, Andy manages to make the corrective move Hunter wanted and fleshes out Faithful Presence in the process. Our pursuit of power, Andy writes, opens us up to the problem of idolatry. We create a god that we hope (pray) will provide what we want but it always disappoints while calling for us to simply try harder next time, to give a little more, to pray a little harder. The power of the idol is strongest when we fear it is slipping away (I can write an entire post on how fears of religious persecution illustrate this key point). 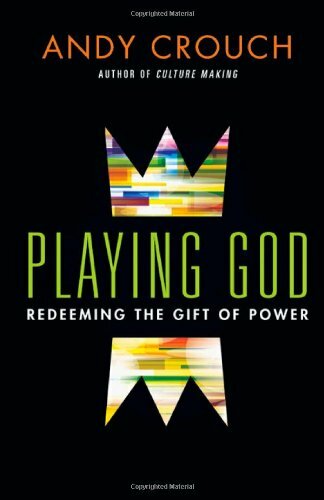 One of the really interesting themes that runs through the book is the linkage between “make-it-so power”, idolatry, and injustice. This is true for those on the bottom of a power hierarchy just as it’s true for those at the top (this point was echoed by Alissa Wilkinson, which is what led me to Andy’s book in the first place). In place of the power of idols, “let us make” power calls for us all, but especially Christians, to see ourselves as icons that reflect the image of the true image bearer: Jesus Christ. Ultimately the reason for both the work of evangelism and the work of justice is not simply the relief of suffering, whether present or eternal. It is the restoration of God’s true image in the world, made known in the one true Image and Icon, Jesus Christ , and refracted and reflected in fruitful, multiplying image bearers set free by his death and resurrection to reclaim their true calling. Our mission is not primarily driven by a calculation of which suffering, present or eternal, we need to relieve most urgently; it is the fruit of glorious promises that call us into a new kingdom where the world is full of truth-bearing images (84). I’ve provided some very small snippets of what is a very thorough and complex argument. But hopefully it’s enough to begin to imagine what church life might look like that could address what I was critiquing in my previous post. Perhaps church is the one place where our broken pasts, our continual shortcomings, our doubts in the midst of our certainties, our prejudices that separate us, our fears that tempt us to build walls, and our sometimes shaky faith all come together in the raw material of “let us make” power. Where we each are assisting others, regardless of station, in living more fully into what God has created us for. This is the power that leads to holiness. Lori, I figured you’d give me bonus points because the suffering part ended up affirming Holiness!